The entire work is identified by the Version Number and date given on the Main Page. Directions for citing the document are given at the bottom of the Main Page. Because of continuing research, the structure of the Y-DNA Haplogroup Tree changes and ISOGG does its best to keep the tree updated with the latest developments in the field. The viewer may observe other versions of the tree on the Web. Email Ray Banks if the differences need clarification or if you find any broken links on this page. ^ Indicates a next-generation sequencing entry which does not yet meet quality guidelines for minimum number of reads. ^^ Indicates an entry which does not meet quality guidelines but may be helpful. ~ Indicates only an approximate location on the tree. The criteria for a representative SNP printed in bold for a subclade is: traditional usage, testing one in multiple labs, and/or being found in the area of the chromosome used in recent research studies. SNPs listed below in italics (colored black or red) are quality variants from next-generation sequencing reports consistently showing as representing that subgroup. DID YOU NOTICE that the items in gray sometimes have a long name preceding their listing that is the same as just above? In this situation, evidence seems to indicate they also belong to the same subgroup, but some confirmatory evidence is not yet available. Identical SNPs that were discovered separately are listed in alphabetical order, not necessarily in the order of discovery, and separated by "/". Example: M265/N14. P89.1 is downstream from MEH2. Listed 7 August 2012. L807 is downstream of L804; Pearson surname. Listed 4 May 2013. L272.1 is downstream from L245. Moved to private on 30 March 2014. Y-DNA haplogroup Q arose in Central Asia and migrated through the Altai/Baikal region of northern Eurasia into the Americas. Today it is found in North Eurasia, with some exemplars in European populations. The Q-M3 sub-group is almost exclusively associated with Native American populations. A1211 s.e. USA, n.e. USA (Wappingers, Mohicans). Balanovsky et al, Phylogeography of Human Y-Chromosome Haplogroup Q3-L275 from an Academic/Citizen Science Colllaboration. BMC Evoluitionary Biology. 17(Suppl 1): 1-15. Battaglia et al., The First Peopling of South America: New Evidence from Y-Chromosome Haplogroup Q, PLOSOne, doi.org/10.1371/journal.pone.0071390 , 2013. Behar et al, Genome-Wide Structure of the Jewish People. Nature, 446:238-42, 2010. Bortolini et al, Y-Chromosome Evidence for Differing Ancient Demographic Histories in the Americas. American Journal of Human Genetics, 73:524-539, 2003. Cinnioglu et al, Excavating Y-chromosome Haplotype Strata in Anatolia. (pdf) Human Genetics. 114:127-148, 2004. Deng et al, Evolution and Migration History of the Chinese Population Inferred from the Chinese Y-chromosome Evidence. (pdf) Journal of Human Genetics, 49:339-348, 2004. Dulik et al, Mitochondrial DNA and Y Chromosome Variation Provides Evidence for a Recent Common Ancestry between Native Americans and Indigenous Altaians. (pdf) The American Journal of Human Genetics, doi: 10.1016/ajhg.2011.12.014, 2012(a). Dulik et al, Y-chromosome Analysis Reveals Genetic Divergence and New Founding Native Lineages in Athapaskan- and Eskimoan-speaking Populations. (pdf) Proc Natl Acad Sci U S A. 2012 May 29;109(22):8471-6. doi: 10.1073/pnas.1118760109. Epub May 14, 2012(b). Francalacci et al, Low-Pass DNA Sequencing of 1200 Sardinians Reconstructs European Y-Chromosome Phylogeny. Science: Vol. 341 no. 6145, pp. 565-569, DOI: 10.1126/science.1237947, 2 August 2013. Gurianov et al, Phylogenetic Structure of Q-M378 Subclade Based on Full Y-Chromosome Sequencing, The Russian Journal of Genetic Genealogy, Rom 5, No 1.:84-102. 8 January 2014(a). Gurianov et al, The Update of the Phylogenetic Structure of Q1b Haplogroup Based on Full Y-chromosome Sequencing, The Russian Journal of Genetic Genealogy, 6:1, 2014(b). Jota et al, A New Subhaplogroup of Native American Y-Chromosomes from the Andes. Abstract. Am J Phys Anthropol. 2011 Dec;146(4):553-9. doi: 10.1002/ajpa.21519. Epub Sep 13, 2011. Karafet et al, New Binary Polymorphisms Reshape and Increase Resolution of the Human Y-Chromosomal Haplogroup Tree. Abstract. Genome Research, published online April 2, 2008. Supplementary Material. Karmin et al, A Recent Bottleneck of Y chromosome Diversity Coincides with a Global Change in Culture. Genome Research, doi: 10.1101/gr.186684.114, published online March 13, 2015. Malhi et al, Distribution of Y Chromosomes among Native North Americans: A Study of Athapaskan Population History American Journal of Physical Anthropology, 137:412-24, 2008. Regueiro et al, Iran: Tricontinental Nexus for Y-Chromosome Driven Migration. (abstract) Human Heredity, Vol. 61, No 3, 132-143, 2006. Sengupta et al, Polarity and Temporality of High Resolution Y-chromosome Distributions in India Identify Both Indigenous and Exogenous Expansions and Reveal Minor Genetic Influence of Central Asian Pastoralists. (pdf) American Journal of Human Genetics, 78:202-221, 2006. Shen et al, Reconstruction of Patrilineages and Matrilineages of Samaritans and other Israeli Populations from Y-Chromosome and Mitochondrial DNA Sequence Variation. (pdf) Human Mutation, 24:248-260, 2004. Su et al, Y-chromosome Evidence for a Northward Migration of Modern Humans into Eastern Asia during the Last Ice Age. (pdf) American Journal of Human Genetics, 65:1718-1724, 1999. Underhill et al, Detection of Numerous Y Chromosome Biallelic Polymorphisms by Denaturing High-performance Liquid Chromatography. 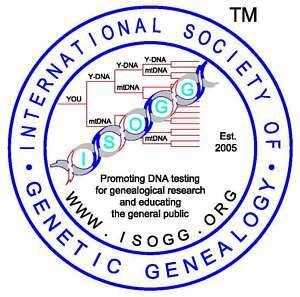 (Abstract) Genome Research, 7(10):996-1005, 1997 Oct.
ISOGG Wiki - What you need to know about Genetic Genealogy. Y-chromosome DNA Haplogroup Q, Rebekah Canada, Alessandro Biondo. American Indian Q1a3a: the Q-M3 Haplogroup Project, Ana Oquendo Pabón. American Indian DNA Project, Glinda Seabaugh. Copyright 2018. International Society of Genetic Genealogy. All Rights Reserved.